Scented flowers add another layer of enjoyment to the garden and more often than not, the scents are full of memories. Some flowers are lightly scented and need to be close by to be appreciated. Other plants engulf the entire yard in their perfume—think of lilacs in spring or a hillside full of lily-of-the-valley. Many modern plants are no longer fragrant, though, due to the genetic manipulation that has gone into their creation. They have been bred to be full and bushy, or disease resistant, or perpetually blooming—and these virtues often come at the sacrifice of scent. Heirloom flowers are often your best bet for having a scented garden, and to grow them you may need to start them from seed. If you'd like to include some fragrance in your garden, here are some tips for getting the most from your scented flowers. 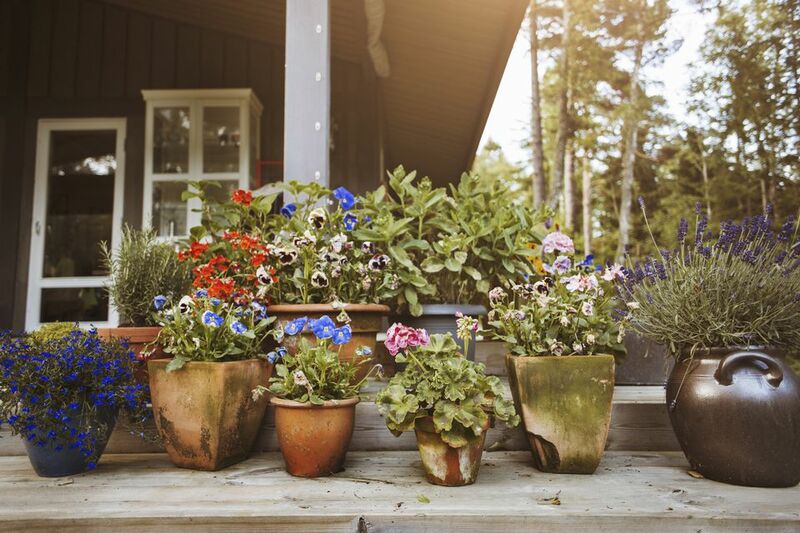 Plant them where you will be able to enjoy their fragrance most frequently—for example, alongside a path, patio, open window, or in a container you can move around easily. Plant in large clumps, for the strongest impact. The scent of flowers will dissipate if they are planted in a wide open, windy area. Spread fragrant plants throughout the yard so that different scents don't compete with each other. Some plants are most fragrant in the evening. Plant them near your dining or entertaining areas. Look for fragrant ground covers and lawn alternatives that can be walked on. Plants with fragrant leaves are even more potent when the leaves are crushed underfoot. The fragrance of flowers will change subtly throughout the day and with variations in the weather and growing conditions. You'll need to experiment with fragrant plants to see which grow well for you and which combinations appeal to you. We don't all appreciate the same scents. Many insects are also attracted to scented plants. The butterflies will be welcome, but keep scented flowers away from children's play areas and away from people who are extremely sensitive to bee stings. f you're ready to add some fragrance to your garden, here are some great plants to get you started. Here, they are broken down by general season, but they may bloom earlier or later in your area. 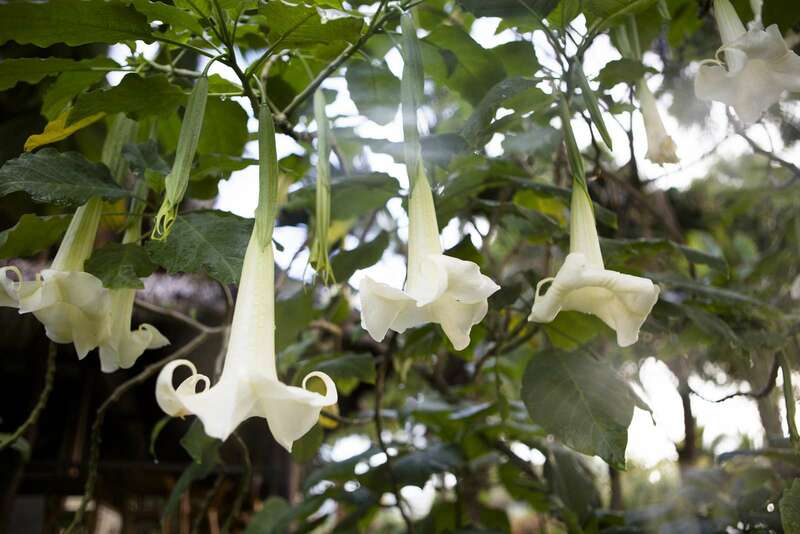 Brugmansia is a large, tree-like plant with 8- to 9-inch blooms that dangle upside down and give off a citrus-floral scent that is most pronounced in the evening. ​Bring indoors, to over-winter in cooler climates. Summer Bloomer: USDA Hardiness Zones 9 to 11. Both the leaves and the small, spiky purple-blue flowers of hyssop have a strong scent of anise. It is a member of the mint family and both the leaves and flowers are edible. Summer Bloomer: USDA Hardiness Zones 5 to 9. The clear white flowers need the longest days of summer to open and release their honeysuckle-like fragrance. You may see this plant listed as White Ginger Lily. Late Summer/Fall Bloomer: USDA Hardiness Zones 7 to 11. The spicy scent of carnations is one of the most familiar flower fragrances. Make sure you purchase a variety that specifically says it is fragrant since many hybrids have been bred for larger flowers and longer blooms but have no scent. Note: Not all carnations are perennial. Summer Bloomer: USDA Hardiness Zones 6 to 9. Chamomile has a very pleasant herbal, grassy scent that is very similar to the fragrance that wafts up from hot chamomile tea. It is often used in aromatherapy because it has a calming effect when inhaled. Summer Bloomer: USDA Hardiness Zones 3 to 9. There's a definite minty scent from both the leaves and flowers of Corsican mint, along with a bit of a bit. It is used as a groundcover, emitting its fragrance as it is crushed underfoot. It is also the flavoring used in Crème de Menthe liqueur. Daphne is a beautiful small shrub with glossy green leaves and flowers that emit a true perfume quality scent that is a mix of sweet florals and earthy undertones. Spring Bloomer: USDA Hardiness Zones 5/6 to 8. Some people find the scent of flowering quince fruity and sweet, others find it offensive. Buy yours in bloom, to ensure you like it. Bees and hummingbirds love the flowers. Spring Bloomer: USDA Hardiness Zones 4 to 8. Nicotiana is sometimes referred to as jasmine tobacco, because of its intense, sweet scent. Go for the tall Nicotiana sylvestris for a fragrance that will permeate the evening air. Many of the shorter, modern Nicotiana alata have only a faint scent. Nicotiana is usually grown as an annual. Summer Bloomer: USDA Hardiness Zones 10 to 11. Mirabilis is Latin for wonderful. The flowers open in late afternoon, in response to cooling temperatures. They may stay open all day on overcast days, but their sweet, lemony fragrance is most intense in the evening. They will self-sow and can be grown as annuals. Summer Bloomer: USDA Hardiness Zones 7 to 11. Aquilegia fragrans is slightly different from the more common garden columbines, although they are almost as easy to grow. They have creamy white flowers that give off a lovely honeysuckle-like scent. Spring Bloomer: USDA Hardiness Zones 5 to 8. Freesia is a popular wedding flower, but it is tropical, so you don't often see it in gardens. However, it can be grown as a houseplant. The tubular flowers have a fresh, fruity, floral scent. Spring/Summer Bloomer: USDA Hardiness Zones 9+. The floral scent of garden phlox can be almost heady, on a warm summer day. The heat intensifies the fragrance. Watch out for modern hybrids that were bred for show, with no scent. Gardenias are one of the most fragrant flowers; some people find them too strong to be near. Although these plants are very tender, they can be grown indoors, where they can be moved and enjoyed from room to room. Summer Bloomer: USDA Hardiness Zones 7/8 to 10. Muscari gets its common name from its enticing grape fragrance. If you have a large clump, you can smell them throughout the yard. These tiny flowers also make nice cut flowers, bringing their bright scent indoors for you to enjoy. Spring Bloomer: USDA Hardiness Zones 3 to 5. Heliotrope has a delightful cherry vanilla scent that gives it its colloquial name of "the cherry pie flower". You'll need a good size clump of plants, to really get the full effect, but it's worth it. Heliotrope is often grown as an annual in colder climates. Unlike so many Hosta varieties that are grown simply for their foliage, Hosta plantaginea (and many of its hybrids like 'Aphrodite'™ and 'Guacamole'™) has lovely white flowers with a charming floral scent. One jasmine plant can perfume your entire yard. The beautiful evergreen foliage and star-shaped flowers are simply a bonus of its spicy, sweet scent. Repeat Bloomer: USDA Hardiness Zones 7 to 10. Many daffodils have a subtle scent, but for a bigger bang, try a patch of jonquils. They have a strong, astringent scent that sneaks up on you, although, like paperwhites (Narcissus papyraceus), not everyone finds it pleasant. Lavender has one of the most beloved scents of any flower. Its musky floral fragrance even permeates your palate when lavender is used in cooking. The sweet, floral fragrance of lilacs announces spring. You can get a hint of it, as the buds start to swell. Once the flowers open, lilacs can perfume the neighborhood. Spring Bloomer: USDA Hardiness Zones 3 to 9. Lilies have a strong spicy-sweet scent. A bouquet of lilies will perfume the house. Both the cut flowers and the blooms on the plant are long lasting and the flowers come in many colors. Lily of the Valley flowers are popular additions to perfume, with their rich, sweet fragrance. This is a quick spreading plant, so plant it where you won't mind it traveling, then enjoy the scent throughout your yard. Spring Bloomer: USDA Hardiness Zones 3 to 7. Magnolias have a sweet, strong, honeysuckle scent that can quickly evoke memories of the first time you were captivated by it. This is a tender tree, very much associated with the South. In northern climates, look for cultivars especially bred for the environment. Spring Bloomer: USDA Hardiness Zones 4 to 9. If you are unfamiliar with mock orange, you might think you are in a citrus grove when it blooms. The scent of the small white flowers truly mimics the scent of oranges. This night bloomer has a surprising scent that is a combination of cinnamon and rose. They take a while to begin flowering, so keep a watch toward the evening, at the end of summer. In cooler climates, moonflower is often grown as an annual. Late Summer/Fall Bloomer: USDA Hardiness Zones 10 to 11. The rather rude common name of Naked Lady was given because the flowers bloom before the leaves appear. The beautiful tubular flowers give off an extremely sweet scent that is often likened to bubble gum. Fall Bloomer: USDA Hardiness Zones 7 to 10. The scent of night-blooming jasmine wafts in and out of the air, usually catching you when the air is still. Unlike Jasminum officinale, which can be very sweet, night-blooming jasmine is often described as a sultry scent. Winter Bloomer: USDA Hardiness Zones 9 to 11. Pennyroyal is one of the strongest smelling members of the mint family. It is an attractive, creeping plant that makes a great ground cover, in areas where you will be walking and releasing its fragrance. Peonies would be beautiful enough to grow just for their flowers, but the lush blooms also have a clear, clean scent that is very similar to roses. They are very long lasting as cut flowers. Spring Bloomer: USDA Hardiness Zones 3 to 8. Although not as strongly-scented as carnations (Dianthus caryophyllus), pinks also have a spicy scent and they are much more widely adaptable. Repeat Bloomer: USDA Hardiness Zones 3 to 8. Although not all roses are fragrant, they may be the first flower most people think of, when it comes to fragrance. There is actually a lot of variety in rose scents, from candy sweet to exotic and spicy. Summer Bloomer: USDA Hardiness Zones 3 to 11. This evergreen, twinning tangle of a vine is not a true jasmine, but it smells so much like one, it earned its common name. A well-established plant will be covered with the fragrant blooms. Late Spring Bloomer: USDA Hardiness Zones 8 to 10. It's hard to believe that stock is a member of the cabbage family. Also known as gillyflower, stock flowers pack an intense clove-like scent in their small flowers. Spring Bloomer: USDA Hardiness Zones 7 to 10. The spicy scent of Clethra is why some people refer to it as pepper bush. The white panicles of flowers are beautifully offset by glossy, bright green foliage. The late summer scent comes as a pleasant surprise. Summer Bloomer: USDA Hardiness Zones 4 to 9. The diminutive plant is so covered with flowers, it looks like a carpet. The fragrance is very unique; a honey-like quality with a floral finish. These are cool-season flowers, for the beginning and end of the summer. Repeat Bloomer: grown as an annual. Sweet Autumn Clematis is covered with a cloud of small white flowers, in fall. Besides their beauty, the flowers give off a gentle vanilla scent, which really hits you if you can walk below the vine. This plant is invasive in some areas. Fall Bloomer: USDA Hardiness Zones 4 to 9. Sweet peas offer an abundance of cut flowers. Unfortunately, breeders have been focusing on more blooms and less fragrance. Look for old-fashioned varieties that have the spicy scent sweet peas became known for. Spring Bloomer: grown as an annual. Sweet woodruff has a grassy vanilla scent, which is much, much nicer than it sounds. It is often compared to the scent of newly mown hay. Be warned, the plant will spread. Spring Bloomer: USDA Hardiness Zone 5 to 9. You may only think of thyme as a seasoning, but it is also a very ornamental plant and a bee magnet. Thyme is in the mint family, but its scent is more herbal and grassy. These flowers have an unusual sweet scent that has been likened to everything from candy to Dr. Pepper soda. The stalks holding the large, white flowers can reach 5 ft. tall. In cooler zones, the bulbs can be lifted and stored for winter. Summer Bloomer: USDA Hardiness Zones 8 to 10.